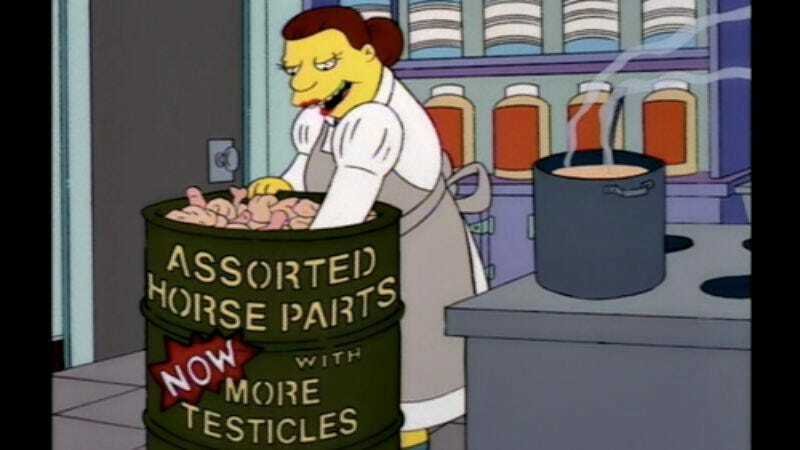 Viewers of last night’s new episode of The Simpsons may have noticed that, as part of a quick sight gag involving a school newspaper, cantankerous, gym mat-grinding Lunchlady Doris was referred to as “Lunchlady Dora.” It was seemingly a slip-up that spurred losers in “Genius At Work” shirts to take to the Internet within minutes and register their disgust throughout the world, making snarky suggestions that the aging show seemed to be losing its memory. As it turns out, the change in name is intentional—and one that, near as I can tell, has never been formally addressed anywhere. The episode’s writer, Michael Price, replied to my tweet saying the show had changed the character’s name long ago out of deference to Doris Grau, the script supervisor who’d voiced Lunchlady Doris until her death in 1995. Since then, Lunchlady Doris has mostly remained a silent background character, until she returned in the 18th season voiced by Tress MacNeille. And now, in a bit of revisionism done out of respect for Grau, she’s quietly been renamed “Lunchlady Dora”—a name apparently heard once before, when Groundskeeper Willie called her that in the 2013 episode, “Dark Knight Court,” but last night seemingly made it official. So, if you want to get good and greased up, you’ll need to see “Lunchlady Dora” now. Anyway, “Lunchlady Dora” isn’t Lunchlady Doris’ twin sister, nor has there been any other in-world, Armin Tamzarian-like explanation for why everyone just calls her that—though now that we’ve had this conversation, Price says, “It’s possible we could do a story explaining Dora’s provenance at some point.” In the meantime, no one shall mention the name “Lunchlady Doris” again, under penalty of torture.